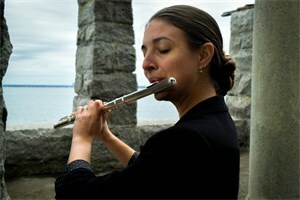 Hailed by the New York Times as possessing “rich tone and deft technique,” Hannah Porter Occeña is Assistant Professor of Flute at the University of Northern Iowa and Principal Flutist of the Topeka Symphony Orchestra (Topeka, KS). Previous positions include Principal Flute of the Midwest Chamber Ensemble (Prairie Village, KS) and Associate Principal Flute of the Bismarck-Mandan Symphony Orchestra (Bismarck, ND). The 2012 Irene Burchard prizewinner at the Royal Academy of Music, Dr. Occeña has performed as an orchestral soloist, recitalist, and clinician throughout the US and abroad. Dr. Occeña is a 2018 DMA graduate of Stony Brook University, where she studied with Carol Wincenc; she holds a Master of Music Dip.RAM from the Royal Academy of Music and a Bachelor of Music from the University of Missouri-Kansas City Conservatory of Music and Dance. When not performing, Dr. Occeña enjoys spending time outdoors with her family. She can be heard on New Beginnings: American and Australian Duos for Flute and Piano with the Occeña-Chen Duo, and Voices from the Middle and Spohr, Forevermore! with the Midwest Chamber Ensemble. She is a Miyazawa Artist and plays on a Miyazawa Elite. Thank you to Alexandria Vricella, Burke Turner, Glasser Images, Echo Marie Johnson, and Ben Langdon Photography for the photographs and artwork used on this site. Please use the contact page to request permission to use photos and artwork not included in the press kit.